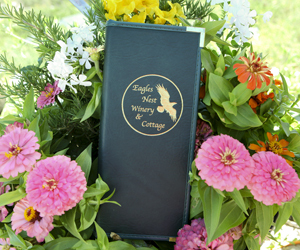 How was the name Eagles Nest Winery and Cottage chosen? For scholars of the English language, a closing grammar note – we omitted the apostrophe in the name to simplify our Internet/Web presence – or hopefully you are another of several “eagles” that supports the plural manifestation of our namesake. With so many wineries, vineyards, and vacation cottages in this nation and globally, it is increasingly difficult to establish a truly unique business name these days – but rest assured while there may be establishments with similar names.